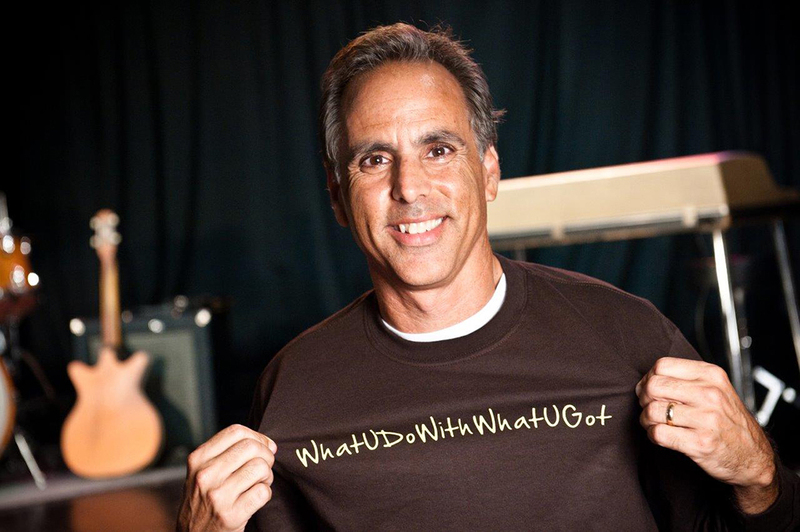 Meet "What U Do" songwriter, producer and fundraiser Joe Zahm. Q: How did you come up with the idea for your song "What U Do With What U Got?" A: I was in a tough spot following the consecutive deaths of my father and sister to cancer and some financial challenges, when I caught a line from life success coach Tony Robbins - that resourcefulness is more important than resources, and how so many people are able to achieve and persevere in the face of overwhelming limitations and obstacles. The song's hook came to me first, then I wrote the six verses from the viewpoint of six different characters, who each possess varying degrees of limitations: Money, possessions, loss of limbs, loss of sight, and loss of hearing. Q: The song's video was first shown at the Coaches vs. Cancer of Philadelphia Annual Gala, correct? How did the song get connected with this organization, a nationwide collaboration between the American Cancer Society and the National Association of Basketball Coaches (NABC)? A: Former Phillies pitcher Cole Hamels and his wife Heidi, who run the Hamels Foundation, were early supporters and sponsors, along with Stephanie Smith, former GM and pioneer of Comcast Sportsnet in Philadelphia. They both loved the song and concept, and Stephanie felt that Coaches vs. Cancer would be a great cause to connect with. She connected us with Phil Martelli, coach of St. Joseph's University men's basketball team, and Fran Dunphy, coach of Temple University's team, both of whom I had met previously, along with Lauren McShea and Ruth Ann Dailey of American Cancer Society-Greater Philadelphia Coaches vs. Cancer. They were all supportive and helpful. Then Jay Wright, coach of current NCAA National Champions Villanova Wildcats and an old friend and fraternity brother from Bucknell University, came on board. As a 1985 graduate of Villanova School of Law, I experienced beautiful symmetry when the video premiered at Philadelphia Coaches vs. Cancer annual gala on April 9, 2016, just after Villanova won its second national championship. Also, my dear friend Harold Jensen, one of the "heroes" on the '85 Villanova championship team, provided assistance and connected us with his former coach, Rollie Massimino, for a tribute to Rollie that was part of the Gala. Now we are using the song and video in other ways to support and bring more attention to Coaches vs. Cancer, which I'm really excited about. We'll be posting more here about that soon. Q: What's been the most rewarding aspect of the song's tie-in with Coaches vs. Cancer? A: To help with the cause, especially because I lost my dad and sister to cancer back-to-back in 2010 and 2011, and to be close to so many who give so much of themselves to the community, especially the coaches and their staffs. They are all great inspirations to me, and there is none bigger than Phil Martelli. Q: What's your vision for "What U Do"? A: I'd like to see it help bring greater attention to Coaches vs. Cancer, and to help raise a lot of money for this organization. We want to crush cancer, not just beat it (to quote Coach Martelli). I'd love to see anyone adopt the song as their personal anthem when they are facing obstacles, and for it to give them a sense of hope, support and perseverance. And of course, I'd love to have it connected to NCAA basketball (March Madness! ), and any other appropriate venue! Q: You're a pretty busy guy, with a lot going on besides this project, in addition to a dedication to philanthropy. Can you elaborate? A: With a major real estate business located outside of the country, three children, and lots of songs in my catalogue, I have a lot of balls in the air. But this is no casual effort; it is, in fact, my vocation. And while we have serious fun making the music, we also take the music seriously. And, we are starting to raise some real money through presenting a What U Do annual fundraising event, with well over $30,000 raised to date. Q: Talk more about that. What is the What U Do annual fundraising event? A: I create and host an annual event where my band plays to raise awareness for the cause, to provide inspiration to those dealing with cancer or who know someone who is, and to inspire people to get involved and help raise awareness and funds for Coaches vs. Cancer. Q: What first got you into music, and when? A: I was always a music lover, though I am a late bloomer as a singer and musician. In September 1999, at Bruce Springsteen's epic 50th birthday show at the old Spectrum in Philly, a powerful feeling swept over me that somehow indicated to me that my life would soon change in a profound way. Shortly thereafter (and several years after producing and writing lyrics for a Caribbean-based reggae band, called Everyman), the "Force" led me to a guitar shop, where I bought a Fernandez plastic back guitar. With it, I sought to overcome the creative monsters of my childhood, perpetuated by Sister George Marie, my first grade teacher, who told me to "mouth the words" in the school choir. I took some guitar lessons, learned a few chord progressions, and started writing my own music. Like musician John Hiatt once said, it was "three chords and go." And it changed my life. Just. Like. That. Now, a decade later, we have about 80 recorded songs, with several projects completed and in production, including a double record scheduled for a late Spring 2017 release, called JZB - Collection: Vol. 1-4. Q: You work with a pretty kickass band. Who are they, and what drew you all together? A: I was producing another artist when Philly music legend Ben Arnold, whom I'd been a fan of, led me to artists/producers Scott Bricklin, Pete Donnelly and Matt Muir. Ben, Scott and Matt were in Four Way Street, and now, along with Tom Gillam, have the band US Rails, who are very popular in Europe. We started recording together in the mid-2000s and keep at it with regular recording sessions and fundraising gigs here in the US and in Turks & Caicos, where my business is located. JZB - the Joe Zahm Band - includes me, Ben, Scott, Pete, Matt, and now Adam Flicker, with lots of stellar horn work by Jay Davidson, and has evolved from my band to my favorite band. Also, producer Phil Nicolo of Studio 4, known for his work with Urge Overkill, John Lennon, Bob Dylan, Amy Grant, Cypress Hill, Sting, Anthrax, Aerosmith, David Bromberg, and many others, is our angel, and a joy to work with. Q: Who are some of your favorite artists/songwriters? A: Bruce Springsteen, Bob Dylan, and Bob Marley are my "Holy Trinity," plus Frank Sinatra. Then, a slew of others, led by Rolling Stones, The Beatles, and The Kinks. Over the past few years, I have become friends with Island Records founder Chris Blackwell, and regularly visit his place in Jamaica, where I always leave rejuvenated by his amazing spirit. Q: What’s next for Joe Zahm? A: My new album JZB Collections Vol 1-4 is a double-disc set containing four EPs and represents several music genres. Each disc is anchored by a cover of a song from the Holy Trinity and Frank Sinatra. I'm also producing a Coaches vs. Cancer benefit concert in Spring 2017. And there's plenty more to come!